I had been living in China for many years, toying with different ideas for a novel, most of them too complicated or obscure for a novice like myself. When my good friend disappeared one day, detained by the authorities in Beijing for working on a documentary they found threatening, I knew that once this horrifying period reached a resolution—good or bad—I would use the incident as my inciting event. At the time, China’s blazing economic growth captured the world’s attention, and media outlets there, including the one I worked for—Bloomberg News—couldn’t keep up with demand for news about how quickly things were changing in China. This included the implications the transformation was having on other economies worldwide, as well as the tremendous trade and other forms of friction China’s rise was causing. There are dozens of excellent books covering the implications of China’s rise from a macroeconomic and, or, a geostrategic perspective. One of these very academic tomes seems to come out every month. 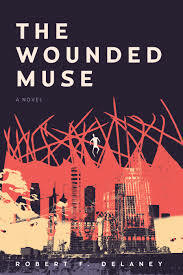 When I began writing The Wounded Muse, I thought it was time for a book that could convey what was happening in China on a personal level, and it’s even more urgent now that mutual suspicion between China and America has reached alarming levels. How do characters on a cultural spectrum, from American to Chinese, respond when they’re forced to work together to solve an urgent problem? More generally, how does the flood of wealth into a country wracked by civil wars, chaos and poverty for more than a century affect people’s lives? The economic and physical transformation of Beijing is referenced constantly, at least in the background of The Wounded Muse, to give readers the same sense of expectation and unease that I always felt as a resident of the capital city. The book started as a work of creative nonfiction, but I eventually had to re-tool it into a novel based on several real-life events in order to create something engaging enough to be commercially viable. I workshopped many chapters of the book extensively to make sure the fictionalized parts ended up as realistic extrapolations of the events that form the story structure. There’s no escape from politics when the subject is China, so I knew it would be foolish to shy away from controversial topics. I knew the choice of a real-life detention without due process and the completely fictionalized bribery operation in connection with China’s bid to host the 2008 Olympics would make me vulnerable to accusations that I harbor an anti-China agenda. That made it very important for me to develop the characters in a way that would allow the reader to sympathize with them. The most heroic character, in fact, is a Mainland Chinese woman who puts her family and livelihood at risk to solve the central problem and throughout the process maintained a degree of respect for the Chinese government. It was equally important to me that the central American character wasn’t the primary driver in the resolution. Details: The Wounded Muse is published by Mosaic Press, in paperback and eBook, priced in local currencies.